Bolzano is a monthly women’s accessory brand that prides itself on high-quality handcrafted Italian leather and vegan leather handbags. 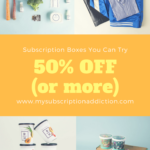 They offer a Purse only subscription as well as a Purse and Accessories subscription. This is a review of the Purse and Accessories, $33.95 per month, box. Once you sign up you are sent a style questionnaire, and Bolzano’s team of stylists picks the bag and accessories you with receive each month. The total value of each months box is up to a $250 value. LIMITED TIME DEAL: Receive a FREE Black Ceramic Watch with the purchase of a 3-month subscription! (Value $125). Good to Know: When you sign up your card will be charged $33.95 + tax and your first box will ship within a day of purchasing. Your next charge will occur on the 10th and your bag will arrive around the 15th. After signing up I was sent a questionnaire that asked me about the colors and patterns I prefer, styles and purse shapes that I liked, and any other information I would like the Bolzano team to know. 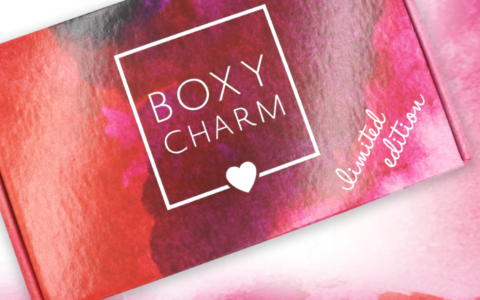 Attached to my box was a note about their purse companions program – for only $8 a month you can get 2-3 name brand beauty items included with your monthly subscription. It looks like the bonus for signing up for this is a free Moroccan Oil worth $34! I also got a sheet explaining the accessories for this month—the theme was dual tone! I also got a Bolzano- branded popsocket! This month I received the Alisse Shopper handbag. While the Alisse style is familiar to me, this particular shape is new- and I love it! This is the perfect size for tossing my iPad pro, a textbook, and a notebook and going to a coffee shop to study. I like that it has open (and deep!) pockets on either side, as well as a middle zippered pocket that has even more pockets inside. At 13.5″ x 15″ it’s a bit too small to toss my laptop in but other than that it fits all of my school necessities. It is made with brown pebbled vegan leather and silver hardware, and it should fit with a large variety of styles. The accessories this month are a matching necklace and earring set that come with reversible sides! One side is black and gold, while the other is silver and white. The necklace is on a long chain and hits me in the mid-chest, making this a great necklace for layering. The earrings can’t really be flipped the way the pendant on the necklace can, but I appreciate how unique they look. Bolzano is currently running a promotion for a free black ceramic watch (valued at $125!) with the purchase of a three-month subscription, and they included the watch so I could answer any questions you may have about it. First of all, I think this is an absolutely beautiful piece. The accents of green above crystals add a fun pop of color while still keeping this professional. It is made of high hardness ceramic, sapphire crystal glass, and Japanese movement, and it comes with a lifetime warranty. It is water-resistant, and it is easy to adjust the date and time by the single button on the side. My wardrobe lacks a nice watch, and I think this one is absolutely perfect. The Verdict: I adore my Bolzano subscription! For $33.95 I received a cute, quality purse and a jewelry set, and I stand by my statement that I don’t think it is possible to find better quality for a better price. The value of the purse alone is $125, and the jewelry set surely adds to that. If you are looking to up your accessory game on a budget I strongly recommend checking out Bolzano. Can you still get this box if you sign up today? You can definitely still sign up, but what bag and accessories you get depends on what you enter into your style profile and what the stylists pick for you. If you have your heart set on a particular piece, reach out to customer service and see if they can help! Value Breakdown: The purse and accessories subscription from Bolzano costs $33.95 per month including free shipping. That is like paying $16.97 each for the purse and the jewelry set! 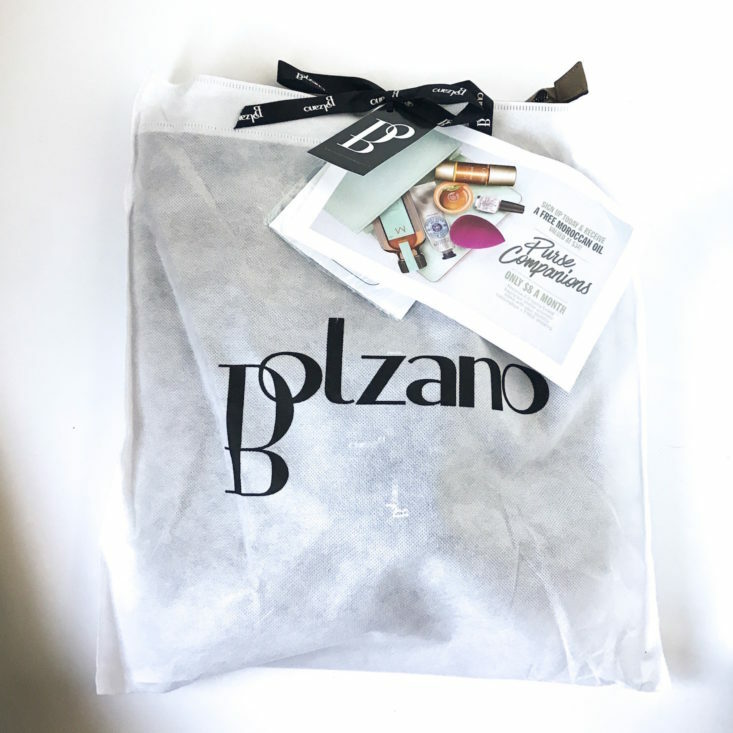 Check out all of our Bolzano reviews and more handbag and accessory subscriptions in the Women’s Subscription Box List! What do you think of my handbag from Bolzano? I’ve been subscribing to Bolzano for over 6 months and I have loved every month. I added the accessories on not long after subscribing and I keep waiting to get disappointed but haven’t been in the least. The jewelry alone is a better quality than some of the jewelry subs which cost way more than the additional $15 per month. I’ve kept most of the items and have gifted a few but truly love every piece I’ve gotten. A + in my opinion. Thanks for the awesome review. I just subbed last week and received my first bag today. I love it, and the watch and the scarf and the earrings and the pop socket. Gave the earrings to a friend who loves them. I’ll be taking the lovely watch into a jeweler to get it sized correctly, definitely worth getting that done right without damaging the piece. I subbed for three months and feel like I already received way more than I paid for, way more!!! Thanks again for your review that took me to subbing. I hate all of the negative comments on this page. I received this bag in a cranberry color and I love it. Its a great value for the price and I love the large pockets on either side of the bag to put stuff in. You can easily slip in a book or Ipad to travel with. This is a great subscription and I love it. P.S. I forgot to complain about this in my other comment so this will have to be part two. I’ve asked both months for information concerning what the style name of my bag is, along with the size info and everything else about it. I love how the blogger her knows the name of this bag, it’s measurements and materials, etc. Must be nice to get that info because they sure don’t send it to us regular folk, and they didn’t return my email when I requested it! If you haven’t guessed I’m slightly angry! Really?? Try chatting on messenger with them. They are right there for you. I’ve subscribed to this for two months now and have given them poor email feedback both months because of the vegan leather both months. I don’t care what other companies are charging for vegan leather, THIS company promised real leather bags at this price point. And their customer service has been nonexistent. I actually lived in Italy for three years and shopped at the leather markets. Real leather bags at these prices are totally possible, and they don’t need to be hideous. Also, the issue of them sending bags that don’t fit the size in the profile I filled out is annoying. I got this same bag in the review in a burgundy color but I said in my profile that I carry very large bags. Mmmmkay. I’m giving it one more month out of curiosity and then it’s curtains. I just cancelled my subscription when the online agent told me they cannot guarantee real leather, if I wanted pleather (vegan) I would shop at Walmart. At least they were honest enough to tell me up front. AND the agent mentioned that large bags would not be leather. I’ve received several Large leather bags, their Fiore Satchel and their Alisse Tote. Yes, they are honest and mentioned that it would not be every month. I got the watch last year as part of my jewelry add-ons and it’s really nice! As someone who only wears a fitbit, it was a big deal for me to pay to get the band sized right, but I thought it was worth it. Hope you like yours! I LOVE the watch and everything else. I have no problem going to a jeweler to get it sized right. That’s what you do with a quality piece. I’m hair with this sun. My first bag plus all the extra goodies covered my cost for a 3 month sub and then some!!! Liz- is there a reason we cannot get a pic of the bag being modeled? We’ve asked several months in a row now and last month was told she would. And still nothing. I would like to subscribe to this but not if I can’t see the size in real life. Inches mean nothing to me in terms of purses, I have to see it on a person to gauge the size. I’ve gone on YouTube for more details, just search bolzano handbags, you’ll find lots of detail there, lots of reviews. I’ve been receiving bags from this sub since September and all the bags have been spectacular. I get compliments all the time. 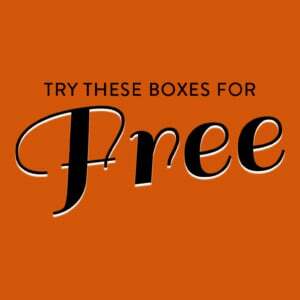 I think it’s one of the better boxes, always offering free gifts too. I used to subscribe to this, when it first became available. They guaranteed an actual leather bag every month. It was $19.95 then. I received a bag that wasn’t for me, and was sent something that I chose. When it came, I didn’t like it all, and packed up both bags. I put the box in my backseat of my car, so I could drop it off at the post office. My car was broken into that night, and the box was stolen along with other things. That’s was the end of my sub. I probably would have continued the sub for a while longer because their CS was amazing at the time. I’m surprised it’s so $$$ for pleathernow, what a rip. Even Coach is going vegan leather and they charge $300 – $400 for a bag. Maybe I’m the minority here but I think these bags are hideous. Every one of them feels like an early 2000s bag. Each bag goes a step to far in terms of design. This bag would be much better if they hadn’t done that top stitching pattern. I’m with you. Haven’t seen a single bag reviewed that I would even consider carrying. Of course I hate to say it but I really feel like no matter how hideous the bag or the jewelry is, the reviews for this sub will always be absolutely glowing. I really don’t like when reviewers are willing to bend over backwards to find a way to write an overly positive review even if they have to abandon all common sense and any sort of objective judgement. This is just one of several subs that will get nothing but praise no matter how poor the style, quality or value. Totally agree that bag isn’t cute at all. That said I would have liked to see a picture of you holding it to better gauge the size and how it hangs. I received the same bag in a dark red. Not loving it. I don’t know why I don’t just cancel. I hate “vegan leather “ and that’s all they ever send anymore. I really liked the first couple bags I received, so I keep hoping to get something else I like. I have seven bags from them now and I think I’ve only ever used two of them. I pay for the bag only, but they did send that popsocket as well as a sleep mask this month. I won’t use either gift, but I thought it was nice surprise. The sleep mask lest too much light through, which is a pretty common complaint I have with sleep masks in general. Blocking light is really their sole purpose. I also canceled after the first vegan leather bag they sent. The three bags they sent when I first joined were lovely in design and real leather but whatever these plastic ones are, they’re not stylish at all. If the owner couldn’t sustain the business model, she should have been upfront about it. Every month there are multiple comments asking the reviewer to post pictures of the bag being held by a person. It’s really hard to tell the size of the bag, unless you can see someone holding it. Maybe it’d be better to have a different person reviewing this box that would be able to provide those types of pictures. Agreed, I’m almost positive after last month she had said she would do that, going forward. And then….not do it. It’s so much easier to tell if a bag will work for you with a picture of reviewer holding the bag just a suggestion. Yes! I was just about to say the same thing. So much easier! When I first saw this bag I thought it would be pretty big because every time I’ve ever seen this style/shape it’s been a rather large bag. It really surprised me when I read that it’s too small for a laptop! I got This same bag and it fits my iPad. If that helps with sizing. And I really like this month’s offering. I just Wish it had a cross body strap. As for the comments about not sending real leather bags, I tend To get a real leather bag every other month. And personally, I would rather use a vegan leather bag this time of year with snow and rainy weather. I’m thinking about subscribing to this subscription…. I ordered last month and they didn’t include the watch and haven’t responded to my emails. I do like the purse and accessories I received, but not happy about their customer service. You should use the chat function on the website. I had great customer service and it was immediate. My first bag was ok, a little stiff for my taste, but the CS rep told me it was because some bags have a certain “profile” and the ones that fell into the categories I liked were a little more sturdy than others, so she adjusted my profile on the spot.